23 kilometers away is the town of Bergerac situated on the northern bank of the Dordogne River and in the western part of the Dordogne department. It is one of the largest, most important towns in the region and has several highlights including an extensive medieval centre and a visit is highly recommended. The first highlight of a trip to Bergerac is the chance to explore the old town – the area immediately north of the river – follow the signs to ‘vieille ville’ or just walk straight up from th e main riverside car park. This part of the town has some lovely streets and squares to explore, and a good selection of boutiques. 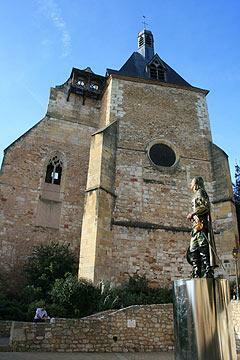 Next to the church is one of Bergerac’s statues of Cyrano de Bergerac… although much is made of the ‘Cyrano connection’ the reality is that there is almost no connection at all between the town and the famous character. This stat ue is also perhaps the most photographed monument in Bergerac and there is often a queue of people wanting their photo take with the statue of Cyrano! There are also several other restaurants scattered around in ‘old-town’ Bergerac among the attractive medieval half-timbered streets, and some open-air cafes where you can pass a pleasant hour or two people-watching. If you have time a nicer way to take a stroll along the banks of the Dordogne River is to walk downstream from the quai area. The path continues along the river banks for several kilometres and into the countryside. The first section is called the Promenade Pierre Loti and is extremely popular with Bergerac residents – and almost unknown to visitors! 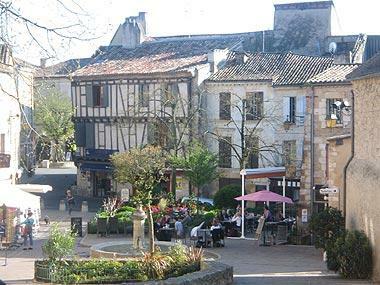 Continue north from the old town to reach the newer centre of Bergerac. Mostly dating from the 19th century this is also an attractive part of the town centred along the Rue de la Resistance and where you will find a a larger range of shops. 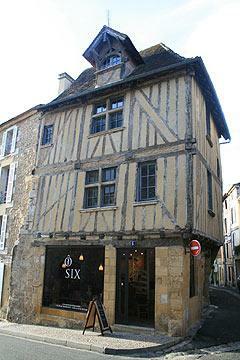 At the western end of this road is the main church in Bergerac and various narrow streets of shops and cafes. The market, held in this part of Bergerac each Saturday, is one of the largest and most colourful markets in the Dordogne and is the best day to visit Bergerac. At the eastern end of Rue de la Resistance is a large square surrounded by imposing buildings (although the square itself is now largely a car park) and where you can find the Bergerac Tourist Office. 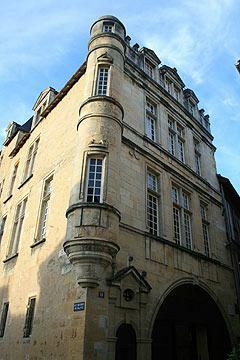 Nearby, the Recollets convent is a beautiful building built in 1630. It has a lovely inner courtyard surrounded by wooden galleries. In the summer it is a lovely spot sometimes used for concerts and near to Christmas there is a Christmas fair here. Throughout the year it is linked to the Maison des Vins de Bergerac (free entry). There is an excellent exhibition of the 13 wine appellations of Bergerac. Wine tasting is available and there is an interactive display where you can amuse yourself identifying the various smells in a glass of wine. When you have explored Bergerac you can take an organised boat trip up the river (start from the car-park at the bottom end of the old-town) to see the town and the nearby countryside from a different perspective. Note – several people we know have done this and said it was a waste of time because the boat didn’t go far enough – I recommend you wait, and take a boat trip from one of the alternative towns further upstream along the Dordogne River. About three kilometres north of the town centre and on the edge of Bergerac there is a large area called Pombonne Park. 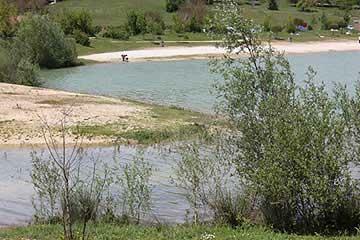 Here you will find trees and nature trails as well as a lake with a small sandy beach. Pombonne is another of the Bergerac highlights where you will find lots of local people but very few tourists know about the lake and beach! Close to Bergerac there are several towns and villages that you will enjoy visiting, especially towards the south-east of the town. These include Eymet, the medieval village of Issigeac and the bastide towns of Monpazier (one of the ‘most beautiful villages of France‘) and Villereal. Just south of the town you can sample the famous wines from the Chateau de Monbazillac. 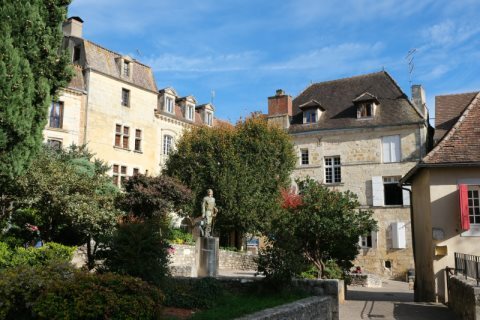 Further east (about one hour drive) you reach the ‘famous’ Dordogne destinations such as Domme, La Roque-Gageac and Sarlat as well as several famous castles: see the detailed Dordogne guide for details.